This is a very kid friendly environment. I would recommend it to any parents with young children. We had a greatvisit! This is a very kid friendly environment. I would recommend it to any parents with young children. We had a great visit! Everyone was so friendly and professional. It was clean & the wait time was great. My appointment was for 2 pm;and it was my first time there so I filled out paperwork (so I came 15 mins early) and was seen by 2:15. I can’t wait to come back. My son loved them all. Everyone was so friendly and professional. It was clean & the wait time was great. My appointment was for 2 pm; and it was my first time there so I filledout paperwork (so I came 15 mins early) and was seen by 2:15. I can’t wait to come back. My son loved them all. 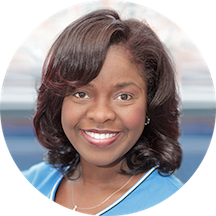 Dr. Francis is board certified in pediatric dentistry Dr T. grew up in Delaware, went to Washington DC to earn a Bachelor of Science in Biology from Howard University. She graduated with numerous awards for academic and leadership from the University of Medical and Dental School of New Jersey receiving her Doctorate of Dental Medicine Degree. She came to New York to complete a general practice residency at Bronx-Lebanon Hospital. Dr. T furthered her education by completing a Pediatric Dental Fellowship at Children’s Hospital of Philadelphia. Afterwards she returned to New York to complete her post doctoral residency training at St Barnabas Hospital in the Bronx where she received her Certificate in Pediatric Dentistry. Caring for the unique dental needs of children and adolescent can be rewarding and demanding. Since Dr. T. Francis successfully combines her skillful talent in helping patients feel at ease with the training necessary to provide the best dental care your children. She has been in private practice for over 8 years. She is an active member in several dental organizations the American Academy of Pediatric Dentistry, the American Board of Pediatric Dentistry and the American Dental Association. This was the best Pediatric dentist office that my husband and I have taken our children to. Dr. Tanesha was so kind and gentle that my child was not nervous at all. The staff was all very nice and made usfeel so comfortable. We have been searching for a good dentist office and we found it. Dr. Francis was lovely and very gentle. It was my daughter's first dental visit and it was a breeze. The entire office is set up to make children comfortable. Highly recommend! She was great. Just took too long to get seen. I had an appointment for 9:30am and wasn’t seen until 11am. The office was very clean , workers were very pleasant and my son was very comfortable with them. What an amazing experience, and quality service we received from Dr. T. Francis and her staff! The entire process, with all 3 children nonetheless, was seamless with a comforting and open environment. We appreciated the entire layout of theoffice from front receptionist to end receptionist. I will highly recommend this office to my friends and family! Our recent appointment was for my 8-year-old; we came in as new patients. NOTE: Dr. Jolly (sp?) saw my daughter, not Dr. Francis. Dr. Jolly was great- very warm, seemed to be good with kids generally, and had specific answers tomy questions. I watched the cleaning/fluoride treatment happen and her technique seemed good and attuned to her patient's feelings. She also asked my permission before applying fluoride, which I appreciated. The waiting room was fine, not so roomy but seemed to be clean. Staff were decently friendly. The wait time was not stellar. Any dental clinic that takes MMC plans tends to pile on the number of people slotted for an appointment time. This office is no different. But for the number of people in the waiting room with us, people seemed to be getting seen fairly quickly. The kids get toothbrushes & the little ones get balloons after their treatments-- glad to see it was not one of those lollipop offices. Overall, we felt like we were in good hands. Best dentist ever. I wish she saw adults! I wish they had a dentist office like this when I was a kid. The office is set up for kids and makes them feel so relaxed that they forget that they're the four a dental visit. The office staff isgreat and Dr. T is simply amazing and explains how to keep your kids teeth healthy. We were so amazed and impressed with all of the staff!! Definitely an A+ experience. I absolutely love this dental office there is not one thing to say bad about this place. They have the best staff ever. We loved our visit. We were seen by Dr. Jolly. Everyone working there is pleasant and professional. we had to wait awhile (indicative of the popularity of this pratice) but once we were called in the staff moved quickly and carefully. My kids and I love this office. Kind, sensitive, informative, excellent with each child's personality, fast, patient, and understanding. Their space is children friendly. I don't know what the rules are for space for children but I would love to see the brightness of theback of the office the same as the front and include more toys. The little door for the children to walk through genius! The tablets great all they need is a swivel back and more than two. Their ability to articulate issues and plans for children teeth EXCELLENT! I brought 4 children, my sun, nephew, and nieces there. I 'm glad I went here. Not one tear and all were welcomed. The dentist and the hygienist were fine, but over an hour wait, for the second time. That’s too much, not going back. First they called and told me my insurance would not cover the evaluation. I called the insurance and they told me they would. I asked that they call themselves but their head of billing would not reciting outdated policy. So Icame in personally and then she still refused to verify my information regarding payment for the evalution. Then she refused to honor my Zoc Docs appointment and they tried to see me as an emergency refusing the evalution. The dentist saw me and recited what their billing person said about the evaluation not being covered. Well then I was sent to the front of which I called my insurance and asked them to call the dentist office. Upon calling the dentist office the their billing person was updated on the current policy and the office agreed to evaluate my daughter. The dentist saw me waiting for my daughter before she knew why I was there. She was dismissive before I told her that my daughter is being xrayed she went in and looked at the xrayed annoyed. Told me that my daughter had one cavity and to make a appointment in the front. I was there for many hours for this treatment and a few seconds of the dentist time. It was as if they have been calling me a liar the entire time. Then they want to pay when I go back. Humiliation supreme. Obviously I wasn't their preferred demographic. Had a great visit. The whole team was excellent and made our first ever dentist apt very easy. Only comment would be that the tv in the waiting room was too loud. Thanks for making it easy. This place was awesome my daughter was terrified visiting a new dentist but everyone in there who worked on her teeth made her feel so comfortable. The Dentist she saw was very sweet and informative. The whole team the people atthe front desk the dental hygenist, the dentist, and the people who helped with Xrays Everyone over there Rocks and I will continue to go to them as long as my daughter can. Thank You guys so much for helping my daughter have such a wonderful experience!!!!!! She is fantastic. Couldn’t be better for kids. The staff was very nice and helpful, The office was clean and kid friendly. Makayla loved her visit and was raving about how nice everyone was at the office. Thanks! The visit went well. The staff are very friendly and professional. I would recommend this office to any parent or guardian. She is kind and clear in her communication with me as well as with my child. Thank you, Dr. Francis! Christina was so friendly and great with my child I thought she was the Dentist; Dr. Francis was not as great, she was good. But overall its a nice place. She don’t even really get a chance to talk with you . Seem like she was rushing she stayed in the room literally 2 mins barely checked my kid teeth and that’s it . Basically the appointment isn’t with her it’s basically with the other workers. Very pleasant environment! All staff made us feel welcomed and well taken care of even if they weren’t attending to my son! Very very nice people! Dr. Tanesha and the hygienist were very helpful and knowledgeable. Our 19 month old daughter was happy throughout her first dental visit. The only thing was the wait time. We were waiting for 45 minutes after our appointment time before we were called in. We’ve already scheduled another appt! Can’t wait to come back! Thanks! Beware of bogus fees! I made an appointment for my toddler because this dentist accepts my insurance. When I arrived, the receptionist asked for payment. I explained that we are in-network and therefore did not owe a copay; our insurance coversall preventive/diagnostic and basic dental work 100%. The receptionist told me that the fee was for "Oral Hygiene Instruction." She also explained that many parents dispute this charge, and she often calls their insurance to verify that the insurance will not cover "Oral Hygiene Instruction". Of course, insurance won't cover this - - it's a bogus charge. There is no need to pay for a dentist to explain that my toddler needs to brush twice a day. This fee is disgraceful and takes advantage of parents who believe they are showing up for an appointment with an in-network dentist. Very knowledgeable and professional. Never a long wait. Best place ever. Fantastic! We found our dentist. We had a bit of a wait, but everything was taken care of that day. Everyone is super nice and no one walked out with tears! The children seemed very happy to be there!